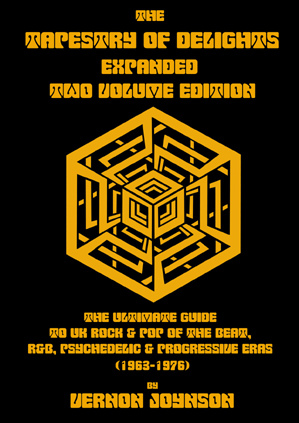 This is our latest title in the series that has already brought us Fuzz, Acid and Flowers (US psych, prog and hippie-rock 1963-1976) (2010), The Two-Volume Tapestry of Delights (UK rock, pop, beat, R&B, folk, psych and prog 1963-1976) (2014) and A Melange Of Musical Pipedreams And Pandemonium (Australian, New Zealand, African, Turkish And Middle Eastern Rock, Pop, Folk, Psych And Prog 1963-1976). There are hundreds of entries (large and small) in this volume. Each entry provides artists discographies (album, EP and 45). The discographies are extremely detailed and, for most entries, artists’ overseas releases are included, as well as comprehensive reissue information, details of retrospective compilations and appearances on various artists’ compilations, where applicable. Most entries contain bibliographical details and descriptions and critiques of the music in as much detail as possible. A rarity scale is also provided for albums and EP releases. The book’s scope is even wider than the title suggests with some other genres, such as jazz and rock-soul, partly covered too. Where artists have been active since 1976, most entries include more information on their careers. The album, EP, 45 and song titles by French Canadian and Latin American artists have been translated into English wherever possible to make them more accessible to English-speaking readers. There are black and white illustrations throughout the book and also 12-pages of colour illustrations. The book will be a numbered, limited edition publication – the precise quantity is still to be determined. This is a longer book than A Melange Of Musical Pipedreams And Pandemonium, and contains 896 as opposed to 768 pages, which means we have reluctantly had to reflect this in the price. NOW AVAILABLE!!! 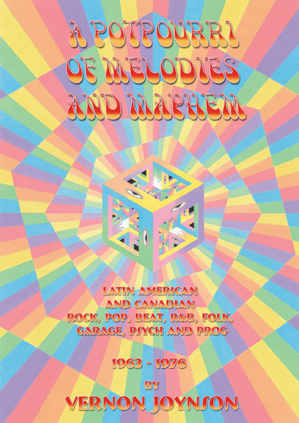 This is the third title in the series that has already brought us Fuzz, Acid and Flowers (US psych, prog and hippie-rock 1963-1976) (2010) and The Two-Volume Tapestry of Delights (UK rock, pop, beat, R&B, folk, psych and prog 1963-1976) (2014). 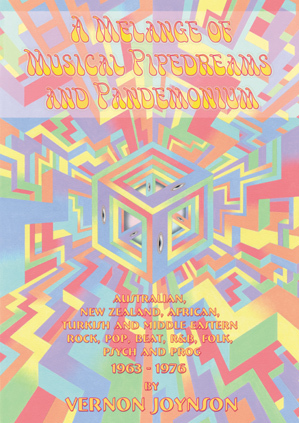 Following exactly the same format as for The Two-Volume Tapestry of Delights Vernon covers Australian, New Zealand, African, Turkish and Middle Eastern Rock, Pop, Folk, Psych And Prog Between 1963 and 1976. There are hundreds of entries (large and small) in this volume. Each entry provides detailed artists discographies (album, EP and 45). The discographies are extremely detailed and, for most entries, artists’ overseas releases are included, as well as comprehensive reissue information, details of retrospective compilations and appearances on various artists’ compilations, where applicable. Most entries contain bibliographical details and descriptions and critiques of the music in as much detail as possible. A rarity scale is provided for albums and EP releases. The book’s scope is even wider than the title suggests with some other genres, such as jazz and rock-soul, partly covered too. The Turkish and Israeli album, EP, 45 and song titles included have been translated into English wherever possible to make them more accessible to English-speaking readers. The African section encompasses music from several sub-Saharan countries, including Afro-rock from Ghana, Nigeria and Zambia; as well as rock and pop from South Africa and Zimbabwe. The book is profusely illustrated throughout and contains a 12-page colour section. It is a numbered, limited edition publication of no more than 850 copies (the precise quantity is still to be finalised). There is nothing currently in print similar to this! Paperback only (there will be no hard back edition of this book). 768 pages; 29.7 x 21 cm plus a 12-page colour section. NOW AVAILABLE!!! 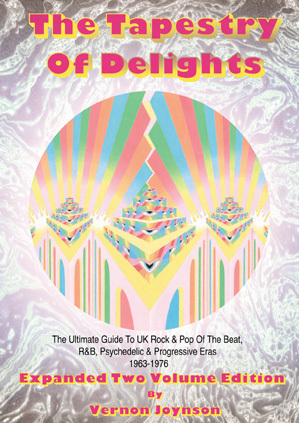 This stunning, vastly expanded two-volume (A-K) and (L-Z) edition of The Tapestry Of Delights Revisited contains all you ever need to know about sixties and seventies rock and pop between 1963-1976. Totalling over 2,000 pages it is over twice the size of the previous edition and over three times the size of the original edition. Even if you purchased one of the earlier editions we think you are going to love this. It is also a wonderful present for fans of sixties and seventies music. There are hundreds of new entries (large and small). 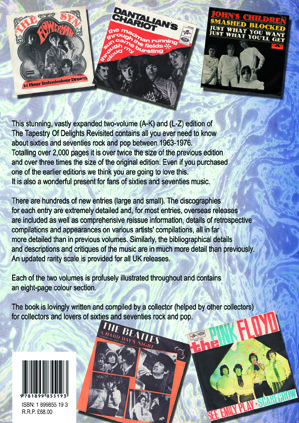 The discographies for each entry are extremely detailed and, for most entries, overseas releases are included as well as comprehensive reissue information, details of retrospective compilations and appearances on various artists' compilations, all in far more detailed than in previous volumes. Similarly, the bibliographical details and descriptions and critiques of the music are in much more detail than previously. An updated rarity scale is provided for all UK releases. Each of the two volumes is profusely illustrated throughout and contains an eight-page colour section. 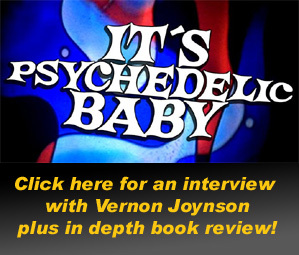 The book is lovingly written and compiled by a collector (helped by other collectors) for collectors and lovers of sixties and seventies rock and pop. 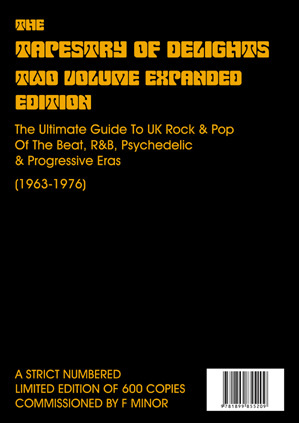 Whilst the book covers both psych and prog in much detail, it also sets out to cover all UK-based pop and rock artists (other than soul or reggae artists) who released vinyl between 1963 and 1976 and who are likely to be of interest to record collectors. This meas that as well as psych and prog acts, artists releasing mainstream rock & pop, beat, R&B, folk, folk-rock, jazz-rock and glam-rock are all covered too. The scope of the book is much wider than 'Fuzz, Acid and Flowers' that focuses on the US. This is because the UK is a much smaller country and had far less acts in this era than the US so it's possible to include more genres. There is just a relatively short list at the end of the book of artists who recorded between 1963 and 1976 who are not included. These are mostly artists' whose heyday was in the early sixties but who continued to record after 1963. There is also a limited edition of 600 numbered faux leather bound copies with gold embossed lettering. Copies are ALSO available directly for £99.99 plus postage from: F. Minor, Unit 8, Commercial Mews North, 45a Commercial Road, Eastbourne, Sussex BN21 3XF, Tel: +44 (0)13-2373-6598, Fax: +44 (0)13-2373-8763 or paul@fminor.com. © copyright Borderline Productions 2017.